When it comes to showering your love, your ladylove deserves nothing less than precious diamond gifts from Zaamor Diamonds. 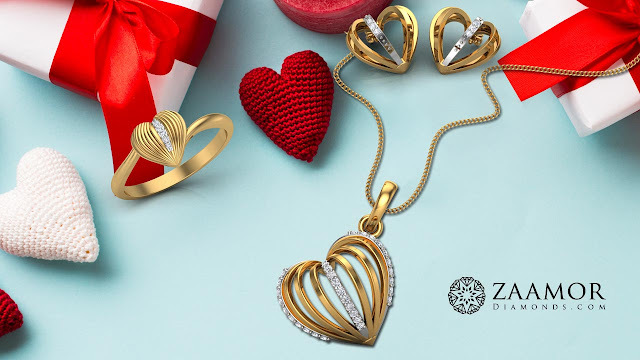 Zaamor Diamonds introduces ‘Heart Jewellery’, a collection featuring handpicked heart rings, heart earrings and heart pendants worthy of that special woman in your life. Explore our Valentine’s Day offer and pick the best Valentine’s Day Jewellery Gifts for Her. Design Story – The collection celebrates the harmony, intensity, and happiness of love from heart, mind and soul channeling true and pure love. Heart, mind and soul together contribute to unconditional love and infinite peace. Thus, the collection attunes with the energy and properties of love, compassion, happiness and kindness. The heart motif and its hollow structure collect impressions of love and affection from mind and heart which enhances the presence and existence of the soul in the body. The heart is key to love represents liberation, mind contributes unbreakable love symbolizes devotion and the soul evoke pride. As Valentine's Day Gifts come from heart and the deepest corners of your soul, adorn and immense yourself with the speculative jewel for this Valentine’s Day surprising and celebrating the most romantic time of the year. Design Range – Collection featuring 18K yellow gold, encrusted with diamonds will become jewellery staples and will be forever lasting reminders of your love as diamonds last forever….just like your love. Classic or edgy, sleek or vintage, bold or delicate the collection comprises of earrings, rings, pendants, bracelets all made in 18k yellow gold with diamonds to suit modern taste and personal style.